The illicit trade in ivory, which has been increasing in volume since 2004, moved sharply upward in 2009, according to the latest analysis of seizure data in the Elephant Trade Information System (ETIS). Cambridge, UK: The illicit trade in ivory, which has been increasing in volume since 2004, moved sharply upward in 2009, according to the latest analysis of seizure data in the Elephant Trade Information System (ETIS). ETIS, one of the two monitoring systems for elephants under CITES (the Convention on International Trade in Endangered Species of Wild Fauna and Flora) but managed by TRAFFIC, holds the world’s largest collection of elephant product seizure records. The analysis, undertaken in advance of the 15th meeting of the Conference of the Parties (CoP15) to CITES, was based upon 14,364 elephant product seizure records from 85 countries or territories since 1989, nearly 2,000 more records than the previous analysis, in 2007. The remarkable surge in 2009 reflects a series of large-scale ivory seizure events that suggest increased involvement of organized crime syndicates in the trade, connecting African source countries with Asian end-use markets. The ETIS data indicate that such syndicates have become stronger and more active over the last decade. There continues to be a highly significant correlation between large-scale domestic ivory markets in Asia and Africa and poor law enforcement, suggesting that illicit ivory trade flows typically follow a path to destinations where law enforcement is weak and markets function with little regulatory impediment. Indeed, the rise in illicit trade in ivory indicates that implementation of a CITES “action plan for the control of trade in African elephant ivory,” the Convention’s principal vehicle for closing such unregulated and illicit domestic markets in Africa and Asia, has failed to drive any significant change over the last five years. 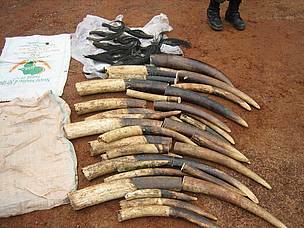 The ETIS analysis identifies Nigeria, the Democratic Republic of the Congo and Thailand as the three countries most heavily implicated in the global illicit ivory trade. Illegal trade involving each of these nations has been repeatedly singled out for priority attention since the first assessment in 2002, but they continue to feature as critical hotspots in the trade as sources, entrêpots and consumers of ivory. Another nine countries and territories—Cameroon, Gabon and Mozambique in Africa and Hong Kong SAR, Malaysia, the Philippines, Singapore, Taiwan and Vietnam in Asia—were also identified as important nodes in the illicit ivory trade. China, which along with Japan was an approved destination of the legal, CITES-sanctioned one-off ivory sale in 2008, faces a persistent illegal trade challenge from Chinese nationals now based in Africa. Ongoing evidence highlights widespread involvement of overseas Chinese in the illicit procurement of ivory, a problem that needs to be addressed through an aggressive outreach and awareness initiative directed at Chinese communities living abroad. The results are less clear-cut concerning the impacts of the CITES approved one-off ivory sales in 1999 and 2008. Following the first such sale, in June 1999, there was a progressive decline in the illicit trade in ivory for five years, with no evidence to suggest that the sale had resulted in an increase in the illicit ivory trade globally. After the second CITES-approved ivory sale, in late 2008, the results are unclear as to whether it has stimulated increase demand or whether it has simply coincided with an increase in supply that was already underway over the last four years. The collection of more data over an extended time period will throw further light on this vital issue.